It is believed suspect Carlos Olivares is responsible for three sexual assaults commencing on 09/04/2015, with the most recent occurring on 01/01/2016. The suspect engages the victims in conversation before sexually assaulting them. On two occasions, he has identified himself to the victims as “Victor”. The suspect has been positively identified in these incidents. 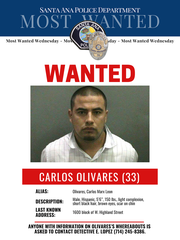 Detectives had information that suspect Olivares may have fled to Mexico, however now it is believed he has returned to the Santa Ana area.